General Motors has reached an 11th hour deal with its South Korean union to stop it from filing for bankruptcy for GM Korea. GM Korea, which includes four auto assembly plants and four engine plants, has been losing money for years. The unit lost 148 billion South Korean won last year, or about $139 million. General Motors had announced plans to file for a bankruptcy for its Korean unit if it couldn't reach a cost-cutting deal with its union. Monday evening it said it reached a deal on an undisclosed cost-cutting package. It will have about 13,000 employees once it completes plans it announced in February to shut one of its South Korean assembly plants. It is also trimming staff through a buyout package offered to employees. The staff buyouts and plant closure are not related to the cost cutting deal with the union. The company is a distant third in terms of car sales in South Korea, well behind Hyundai and Kia which are both owned by Hyundai Motors. Figures from GM show it sold 132,000 locally built cars in South Korea last year, or about 7.4% of the market. By comparison, Hyundai and Kia account for about 65.4% of the Korea market. GM (GM) also sold about 2,000 Cadillacs in South Korea that were built in US auto plants. Its overall South Korean sales in 2017 were down about 25% from a year earlier. A GM assembly line in South Korea. The company said a deal with the union there would prevent it from filing bankruptcy for GM Korea. But most of the output of the South Korean plants went for exports, including to the United States. Last year it exported about 400,000 cars, as well as another 500,000 vehicle kits that went through final assembly elsewhere. But the Korean plant's output has fallen from about 1 million cars a year as recently as three years ago, to about half that number last year, partly because GM stopped selling Chevrolet cars in Europe two years ago. That had been a major market for its Korean exports. 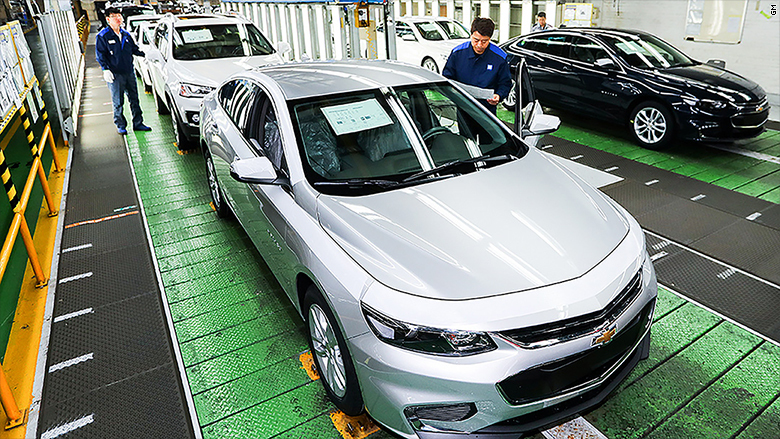 Demand for GM Korea's exports is likely to keep falling after GM sells its remaining Europe brands and exits that market altogether. It's also exiting the Indian and South African markets. Still, GM had said would invest $2.8 billion in the South Korean unit if it could reach deals with both the union, the Korean Development Bank and the South Korean government to create a more competitive business model. "The labor union has demonstrated its commitment and we continue to work with our other key stakeholders to gain their support," said Kaher Kazem, CEO of GM Korea.